Obama; George Bush called for immigration reform. "He didn't call for self-deportation." Press file handed printed transcript of the debate so far. Hofstra FTW. Obama voter tells Obama he's not as enthusiastic any more. Next question: "Mr. President... what have you done to earn my vote" again this year? At a Republican presidential primary debate in January, Romney said he was in favor of "self-deportation," a policy that involves making economic conditions so difficult for undocumented workers that they choose to leave the country to find better opportunities. I love this #CNNDebates voter approval line. Nearly every time Romney interrupts, it goes down. "The commitments that I've made I've kept," Obama answers, "and those that I haven't kept, haven't been for a lack of trying." I hope this won't be the 3rd debate in a row that O gets more time. 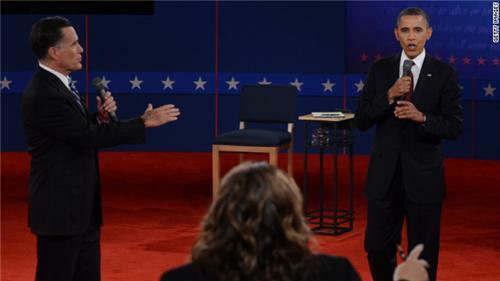 Romney after Obama response to same man: "I think you know better... if you elect President Obama you know what you're gonna get." This soft spoken listing of O's broken promises is devastatingly effective. @mittromney: sir, I am not self-deporting. All 11 million of us without papers are not. We want a fair process. Is the town hall audience still there? I can't look. Big mistake by Obama to attack Romney on the size of Romney's pension. Cheap shots don't work at this level. Smart move by Romn to broaden Libya question into criticism of O overall MidEast policy. Obama on Libya: "I'm the president and I'm always responsible." "She works for me. I'm the president and I'm always responsible," says Obama of Clinton's comment. Obama: The suggestion that anyone in my team would play politics or mislead...is offensive. "Buck stops here" answer all well & good but at some point we should look closely at that buck. Libya "intelligence failure" not going away. Obama makes eye contact with Romney: "The suggestion that anybody on my team -- whether secretary of state, U.N. ambassador, or anyone on my team -- would play politics or we mislead when we lost four of our own is offensive, governor." Wow, question abt guns. Audience questions are really solid. Sounds like it might be Libya that people are responding to above. Tonight's town hall format has provided for several heated moments when the candidates have directly engaged each other.